What's wrong with this picture: carriage trade-funded science finds "happy" horses. Reporters fell for it and horse experts point out obvious limitations of ill-conceived study. Cortisol is not a measure of horse well-being. New York City's carriage drivers thought it would be a good idea last year to pay for a study that would find carriage horses to be content, if not downright happy! So they teamed up with a California veterinarian to get the job done. Fast-forward to early April 2015. That's when Joe Bertone, DVM, made news headlines with his preliminary findings that New York City's carriage horses are "stress-free." He announced this on the basis of his team's two-day evaluation of a baker's dozen (13) carriage horses, based on cortisol sampling and observation. "We found no evidence of stress in these horses," he said, apparently in earnest and unapologetic in making the jump from objective cortisol measurement to subjective speculation about carriage horse contentedness and well-being. Equine experts are taking issue with news reports, most all of which broadly misrepresented these preliminary (unpublished) findings. Holly Cheever, DVM, an equine specialist and veterinarian who now has a private practice in Vorheesville, NY, offered perspective on the study and the issue. She is not involved with the study. "Whether their cortisol levels are elevated or not, the life on the streets for carriage horses inarguably places them in an inhospitable environment in which they suffer the blistering heat of summertime city pavements and the searing cold of last winter's high wind chills and low temperatures," she said. "These horses are essentially incarcerated 24/7 between the shafts of a carriage and the close confines of their stalls with no opportunity to experience the essential 'turnout' with a compatible buddy, permitting them to properly relax and satisfy both physical and behavioral needs." "They are always at risk of severe injuries from spooking in high-volume traffic congestion. They simply do not belong in traffic: the question is not whether their lives are survivable but rather whether they are humane," said Dr. Cheever, who serves on the Leadership Council of the Humane Society Veterinary Medical Association and advises the Coalition to Ban Horse-Drawn Carriages. What we know, what we think we know, and responsible reporting. Although the science of determining a horse's emotional state is incomplete and the answers continue to elude researchers, the nature of a horse to spook easily and at the slightest provocation is well-established. Two days after this troublesome study came to light, we learned of the tragic death of a mother of two small children in Arizona following a horse-drawn carriage ride gone horribly wrong. The horse spooked for reasons unknown, and the woman reportedly jumped from the carriage with her 1-year-old son in her arms, saving his life. Carriage accidents involving human fatalities have happened in recent years in Iowa, Austria, and the UK, among other places. Horses also spooked in Charleston, South Carolina and Savannah, Georgia, where in April 2014, a New York family jumped from a runway horse carriage. 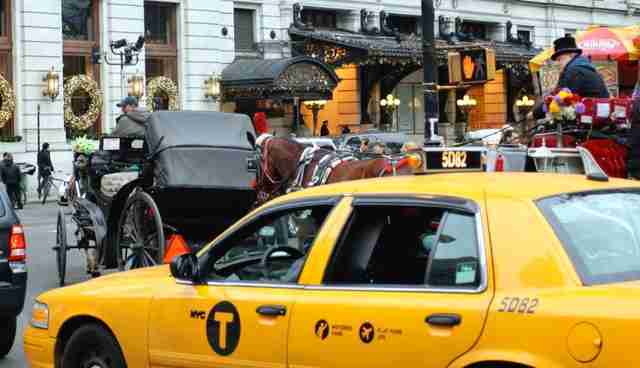 In New York City, passengers as well as carriage drivers have suffered serious injuries in spooking accidents. 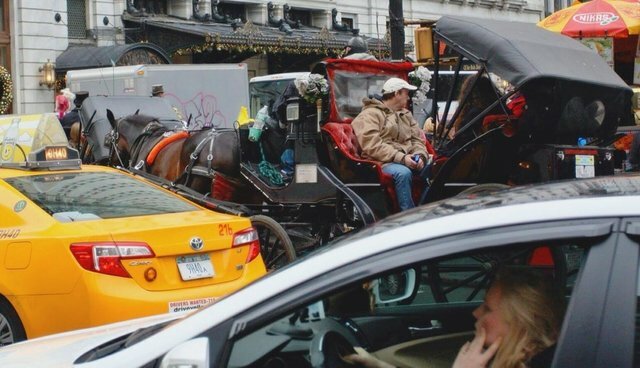 Examples include the gruesome 2006 accident that cost carriage horse Spotty his life and nearly killed the carriage driver; a 2011 accident - one of several within a week - in which a taxicab slammed into a carriage; and a 2012 accident that injured three people, including the carriage driver. Although carriage drivers like to call their horses "bombproof," which means that they never "lose their cool," no horse is unspookable. Yet, hapless celebrities and actors looking for publicity - notably, actor Liam Neeson - have spoken against a ban. Dr. Bertone's study cohort of 13 horses represents approximately 6.5 percent of New York City's carriage horse population, which numbers around 200. The Horse & Carriage Association of New York paid $5,000 toward the study, which was conducted from Aug. 3 to 5, 2014. Dr. Bertone is supportive of NYC's carriage trade, which he has called "iconic." On the basis of measurements of cortisol and subjective evaluation, Dr. Bertone, a faculty member at Western University of Health Sciences College of Veterinary Medicine in California, went on to describe the horses as "content" to be working in traffic-gridlocked Manhattan. 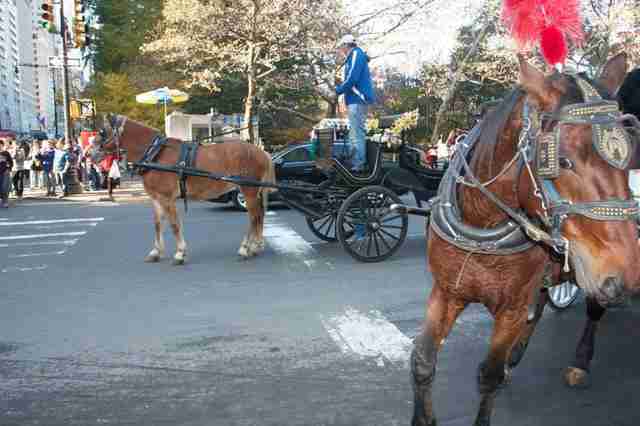 Two of the stables are approximately 2 miles from Central Park, subjecting those horses to a 4-mile daily commute. The preliminary findings, titled "Evaluation of Well-Being of New York City Carriage Horses," are troublesome in many aspects, from carriage trade's funding of the study to its small sample size. Perhaps most concerning is the premise itself: Cortisol sampling is not an established or appropriate surrogate marker for, or measure of, horse well-being. The study has not undergone the rigors of peer-review, although Dr. Bertone said he plans to submit it for publication in the Journal of the American Veterinary Medical Association. Benefits and limitations of cortisol measurement in equines. In equines and other species, cortisol levels fluctuate over the course of a day, with peak secretion in the morning. Measurement of free cortisol levels has diagnostic value in detecting relative adrenal insufficiency (RAI) or critical illness-related corticosteroid insufficiency (CIRCI), both transient conditions that can accompany acute illness. Despite decades of study of how corticosteroid measurement correlates to a variety of equine physiologic processes, there is no association between cortisol and any meaningful measure of horse "contentment." In a study by Rietmann and colleagues of horses with pain from laminitis, for example, cortisol levels were found to be poorly correlated with other physiologic and behavioral measures of stress responses. Nedim C. Buyukmihci, VMD, an Emeritus Professor of Veterinary Medicine at the University of California, Davis, took issue with the premise of evaluating cortisol as a key measure of horse welfare. "The bottom line, and one which I can state unequivocally, is that cortisol concentrations are not an indicator of welfare or well-being," said Dr. Buyukmihci, who is not involved with the carriage horse study. "This is generally considered a poor indicator of welfare; instead, it is an indicator of stress. One of the problems is that the concentrations may level out over time despite stressful conditions, due to habituation." Similarly, Dr. Cheever challenged the assertion that carriage horse well-being can be determined based on the stress measurement involving cortisol sampling. She said pregnant sows in gestation crates and exhibiting behaviors exemplifying psychosis "tend to have normal cortisol levels, allowing the pork production industry to claim that gestation crates are a humane housing system." Coalition commentary on a study with designs on stopping a ban. In the absence of an objective test of horse happiness, as suggested by Dr. Bertone, what we currently know is that horse-spooking accidents are inevitable and often have grave consequences. Serious accidents will keep happening in New York City as long as carriage horses operate there. 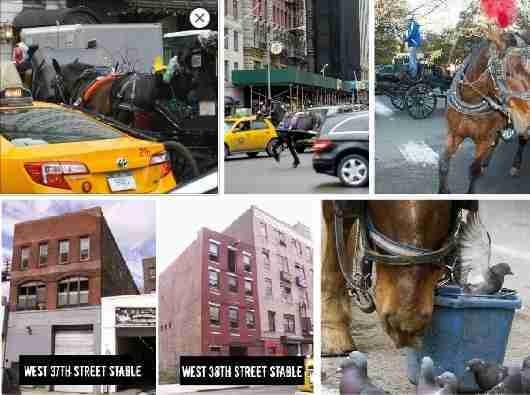 I am stunned that a professional would engage in this study, bought and paid for by the Carriage trade, with such a small sampling - 13 out of more than 200 horses - and expect that this would be the last word and that Mayor de Blasio should call off the ban legislation," Forel said. "Regardless of how the other side wants to spin this, there is no denying the punishing conditions under which the horses work and the fact that they are prey animals who can spook at the slightest provocation and cause serious accidents, as has happened around the globe."